Taste the difference. STOUFFER'S is made with high-quality ingredients. 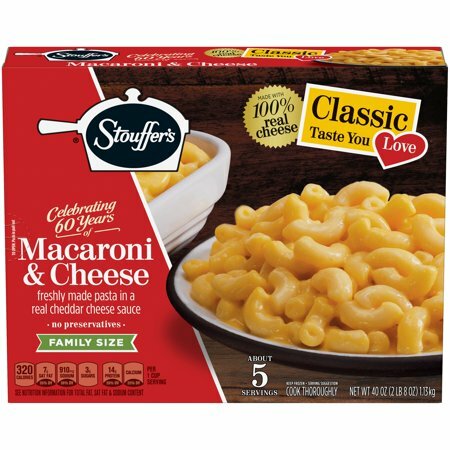 Did you know STOUFFER'S offers over 20 meals to feed your family, big or small! Ensure product reaches an internal temperature of 160°F.Directions developed using 1100 watt microwave oven. Ovens vary; cooking time may need adjusting. Do not prepare in toaster oven. Do not reheat tray. Cook thoroughly. Ingredients: Sauce: Skim Milk, Water, Cheddar Cheese (Cultured Milk, Salt, Enzymes, Annatto Color), Cheddar Club Cheese (Cheddar Cheese [Cultured Milk, Salt, Enzymes], Water, Salt, Annatto Color), Wheat Flour, Soybean Oil, Butter (Cream, Salt), Salt. Cooked Pasta: Water, Semolina Wheat Flour, Wheat Gluten. Noodles-the same Flavor- the same The sauce is alittle bit on the watery side i think someone fell asleep in the production department because the recipe does taste the same except for the sauce alittle bit runnier than it used to be. I myself prefer it thick and creamery fix that issue i will be buying way more often. We're sorry to hear that this dish was watery. Expect an email from us shortly. Just bought this with the new red packaging, and the first thing I thought when I took a bite was omg they changed it and added more flour or somthing...I hope the old stuff comes back!! I've loved this since I was a little kid please never mess with the recipe! It was perfect! The margarine ruined it! Bring back butter! My store recently started stocking this new version of M&C and I thought it was only a packaging change. Upon cooking I immediately noticed how watery the sauce was, not the thick more homemade style I was used to. When I tried it the taste just wasn't the same. I went back and bought an older package to find that one ingredient had changed- Butter has now been replaced with margarine! I knew something was off. Even this page is listing butter as an ingredient but that is not the case for the packaging being shown and should be updated. I really hope this isn't a permanent change because this mac and cheese has been my favorite since childhood. What have you done to the original mac & cheese??? I typically save comfort foods like macaroni and cheese for special occasions, or if I need to follow a soft food diet. I recently had oral surgery, and was placed on a soft food diet for two weeks. I elected to make the best of the situation by allowing myself the luxury of indulging myself with what was my "go-to" mac and cheese... Stouffer's. I loved the cheesy, crusty edges, the creamy, cheesy but somewhat al dente elbow macaroni. Imagine my surprise -- and disappointment -- after heating up the package to find that it was a soupy, boxed mac and cheese-flavored experience. It tastes very much like the stuff you can buy and assemble from a box... it doesn't taste like real cheese anymore. Crispy edges? Gone. It is as close to a macaroni soup as one can imagine. Now I'm stuck with three additional packages that I cannot eat. Please, for the love of all things macaroni and cheese, bring back your OLD recipe. This stuff is "not" an improvement; if it's not broken, please don't fix it!